This is a very nice example of the 1907 Indian Cent in Extra Fine condition. An even brown in color both obverse and reverse and problem free. This will be an admirable addition to any Indian Cent collection. The Indian Head cent, also known as an Indian Head penny, was produced by the United States Mint from 1859 to 1909. It was designed by James Barton Longacre, the Chief Engraver at the Philadelphia Mint. From 1793 to 1857, the one cent piece now known as a "Large Cent" was a copper coin about the size of a half dollar. As rising copper prices made it expensive to keep striking them, the Mint decided to reduce the size of the cent. In 1857 and 1858 they issued the Flying Eagle cent. These new cents were identical in diameter to modern cents, though somewhat thicker and made of copper-nickel. The design was difficult to produce and the Mint soon replaced the coin with the Indian Head design. A laurel wreath was initially chosen for the reverse but was replaced in 1860 by an oak wreath with a shield. Cents were hoarded during the economic chaos of the American Civil War, when the metal nickel was in short supply. Mint officials noticed that privately issued bronze tokens were circulating well so they passed the Coinage Act of 1864, authorizing a slimmer version of the Indian cent mad of bronze alloy. In the postwar period, the cent became very popular and was struck in large numbers in most years. 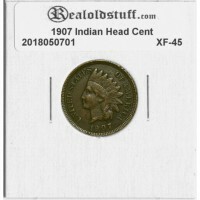 The Indian head cent was last produced in 1909 with the final two years seeing the first San Francisco mintmarked version of the coin.